My friends Lee and Jon have had just about as thin a start to the season as I have myself. However, being doggedly persistant or just plain stupid we have kept at it. The other morning we met, by chance, on a rocky stretch of the Purbeck coast. All three of us were armed with spinning rods and using lures poppers or plugs of various sorts. After an hour or so fishing on the ledges we had caught nothing. In fact Jon had hooked a modest wrasse which somehow managed to remove the J11 from his line (possibly on a sharp rock edge?). This is unusual and like most anglers, Jon was more concerned about the fish than about the lost lure. Hopefully it managed to shed the hooks and escape. 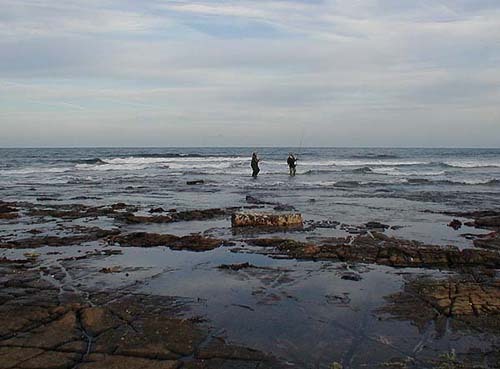 Anyway, we left the ledges and walked for a mile or so along the shore fishing as we went. By now it was almost high tide and we decided to return to the ledges for another go before packing in. 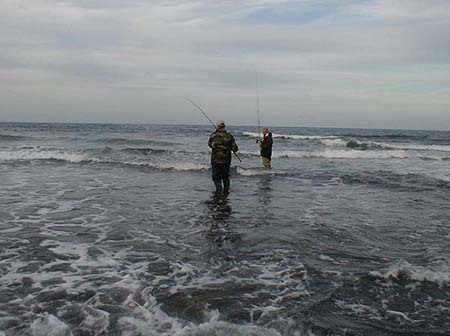 We waded into the surf and began casting again Lee was using a Rebel, I had on a J11 and Jon (unlucky or what!) having lost a thunderstick in a snag, was using (I think) a 'Toby Rocket' spoon. 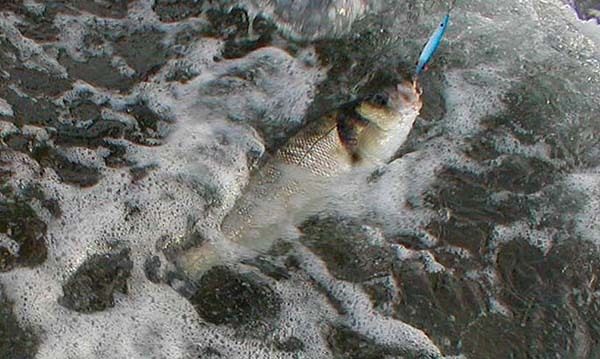 The latter, a heavy, sinking lure, casts well but could easily snag in the shallow water unless retrieved smartly. After half-an-hour or so, to my surprise, I had a bite and hooked a reasonable bass. The fish was only about ten yards out and I could see at once that it was well hooked and unlikely to come off. 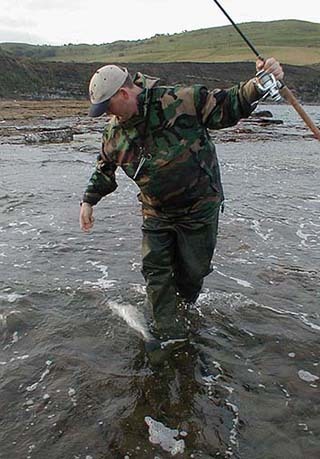 I played it in and slid it onto the wet rocks before laying down the rod and running up to get the camera from my bag. When I turned I could see that Jon was also into a fish. I took a quick shot of my bass and then several of Jon playing his one. 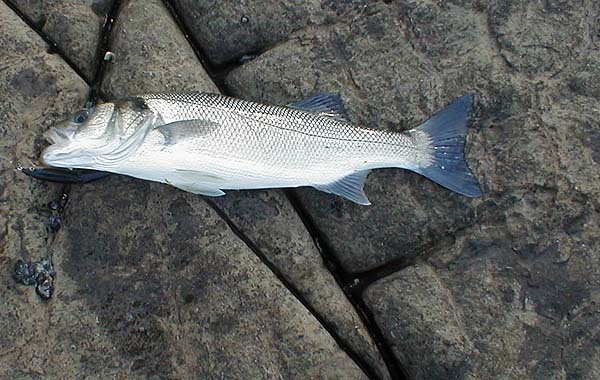 It turned out to be a beauty of six pounds and only lightly hooked on the tail treble of the spoon. The tide had turned now and we had no more bites. Shortly afterwardsI left the lads to return home for breakfast - what a cracking morning! Persistance rewarded. 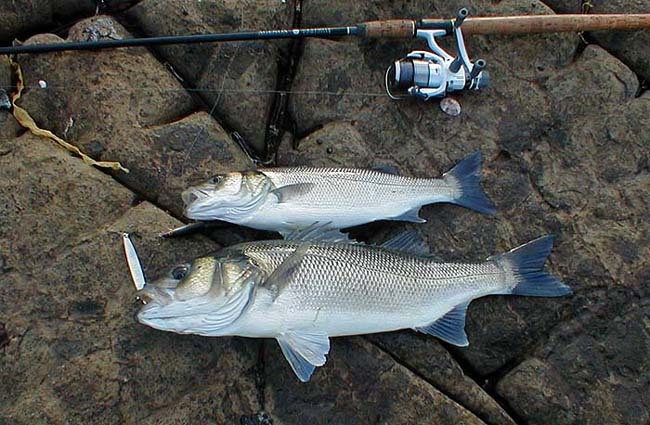 A fine pair ready to be released.